We are happy to have Lisa K. Chanoff join FTJ's Advisory Board. Lisa brings a wealth of experience to FTJ. She has a Masters Degree in Museum Studies, and has worked on exhibitions and educational programs with the Contemporary Jewish Museum in San Francisco and the Judah L. Magnes Museum in Berkeley. Welcome Lisa! Thanks to a grant from UpStart Bay Area, our non-profit business incubator, we have been able to hire Katharine Brewer to begin developing our wholesale and affiliate marketing programs. With these efforts, FTJ will be able to work towards providing synagogue, Judaica and fair trade stores with a larger choice of products to order, as well as provide a one-stop-shop for all things Fair Trade Judaica on our new and updated website, coming in the next few months! Katharine was the Director at the Haas Business School's Center for Responsible Business for five years, and brings a wealth of experience with her. Imagine being able to pray wearing a fair trade tallit wrapped around you! 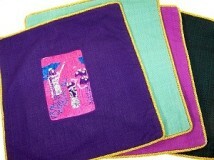 Beautiful hand woven 100% cotton tallitot are now available from Guatemala through MayaWorks. 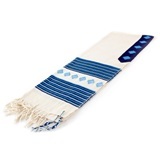 Each tallit is decorated with stripes and Maya-inspired stars in shades of turquoise and blue or reds and browns, and is available in two sizes. 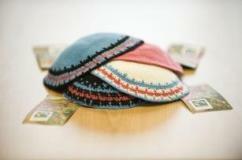 The Jewish Community in the U.K. has worked with their local fair trade organizations to produce hand crocheted kippot, made with 100% Fairtrade cotton yarn which has been ethically sourced and made by cooperatives in India. Celebrate a "Fair Trade and Slavery Free" Pesach/Passover! Pesach is coming early this year (Monday, March 29), and there are more "fair trade" ways to celebrate it than ever before. Add fair trade chocolate to your seder plate as a symbol of current day child slavery in the cocoa fields. Global Exchange has created an excellent haggadah supplement, Next Year, an End to Slavery in the Cocoa Fields, which you can find on our website. Treat everyone to a taste of fair trade chocolate by giving it as the gift for finding the Afikomen! Treat yourself to a beautiful new handwoven matzah cover made in Guatemala and brought to you by Mayan Hands. Each cover has three pockets, and the front is decorated with a fully hand embroidered scene from the life of Moses. 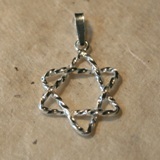 We are working with fair trade producers and wholesalers to develop new fair trade Judaica products. Please let us know what you're looking for. Copyright © 2007, 2008, 2009, 2010 Ilana Schatz and David Lingren. All rights reserved.